Get the critical reagents for creating a reporter cell line that expresses GFP from your promoter-of-interest at the AAVS1 Safe Harbor Site. 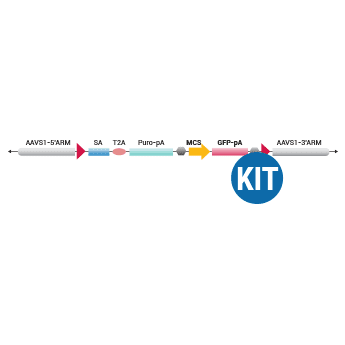 This Kit bundles together an HR Donor—the AAVS1-Targeting Reporter Knock-in HR Donor Vector 2.0 AAVS1-SA-puro-MCS-GFP—a Cas9/AAVS1 gRNA delivery construct—the All-in-one Cas9 SmartNuclease & AAVS1 gRNA Plasmid—and a 5’ and 3’ primer mix for a Junction PCR Assay to verify integration into the AAVS1 site. Our second generation, Reporter Knock-in HR Donor Vector 2.0 AAVS1-SA-puro-MCS-GFP contains a multiple cloning site (MCS) upstream of a promoterless GFP, enabling creation of a reporter cell line that expresses GFP from the AAVS1 locus using the promoter of your choice. Like all of our AAVS1 HR Donor Vectors, it come with AAVS1 homology arms already cloned in, simplifying your workflow. Just ligate-in the promoter of your choice and co-transfect with the included All-in-one Cas9 SmartNuclease & AAVS1 gRNA Plasmid. You can verify correct insertion with the included 5’ and 3’ Primer Mix for Junction PCR Assay.